D-RING ON BOLT PLATE MBS 46,000 LB. The Bolt on D-Ring is perfect when a welded (permanent) lashing point is undesirable, or perhaps the surface is not weldable. Another bonus is this assembly can be fully proof tested by Tandemloc unlike the weld down types that only offer the potential for a limited test, since you weld the strap to your structure. Of course, like most of our products, this item is customizable. We can offer differing capacities, plate sizes and bolt hole patterns. The bolts shown are not included. Please note that the strength ratings expressed are "ultimate" loads or "Breaking Loads" and not "working loads." The strength is based on a single vertical pull, although most applications will result in the load direction to be at an angle or a compound angle. Please consider the angle(s) of pull you will encounter with your application as it increases the strain on the tie down at any given weight load. PLATE MATERIAL: ASTM A36 Steel .75" Thick. 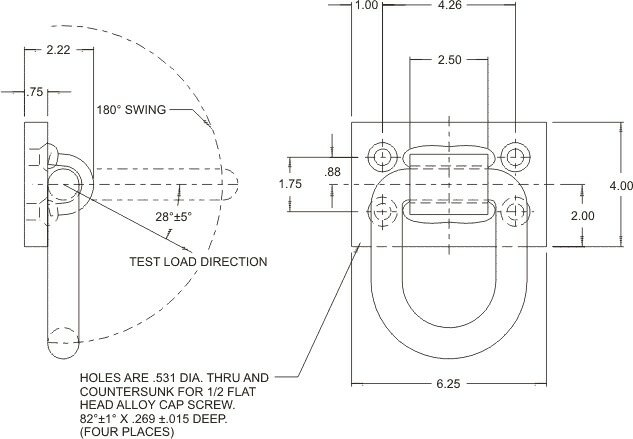 See the D-Ring and Strap page for D-Ring and Strap Dimensions and Strength Data. Bolt holes are countersunk for flush flat head cap screws installation. D-rings and straps are self-colored or primer-painted and bulk packed. D-rings and straps have temporary corrosion resistance; however, minimal rust spotting due to abrasion from bulk packaging should be expected. Note that loads are expressed as breaking loads and not working load limit, which is to be determined by the user. Apply an appropriate safety factor. If used for lifting the safety factor should be 5:1 and the item should be proof tested.